Self-adhesive sealing tape for jointing balcony profiles and sealing membranes. An integral part of the Gutjahr external tiling system, DiProtec® AB-KV self-sealing adhesive tape technology ensures that balcony edge profiles are seamlessly connected with cement-based waterproof coatings such as BAL TANK-IT to create a permanent seal. Half of the sealing tape is attached to the edge profile, while the other half is connected to the corresponding seal. 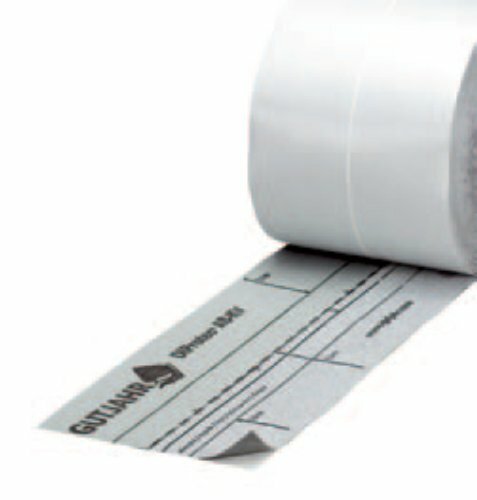 Easy to apply, pre-fabricated sealing tape for Gutjahr external tiling systems. Use for easy connection of BAL Tank-it waterproof membrane to ProFin® DP drainage profiles. Self-adhesive. Plastic side on profile, fleece side to connect with membrane. Only to use in combination with drainage mat systems. Composition: Underside butyl (self-adhesive). Top 75mm plastic/ 75mm fleece.